It’s time for another Pat’s Pints blind taste test, and what better style for surviving the cold days of winter than an Imperial Stout. This style originated in 18th century England and was given the moniker Russian Imperial Stout because it was brewed with an unusually high amount of malts, alcohol, and hops to weather the thousand mile sea voyage to Russia where it was a favorite of the Russian nobility. Katherine the Great was purportedly a big consumer of Imperial Stouts, which would make RIS one of the earliest chick beers. The Bolshevik revolution put a serious damper on the export market and the style steadily declined in popularity over most of the 20th century, but over the past 2-3 decades American brewers and drinkers have adopted this style and raised it to new heights. Imperial Stouts dominate the ranks of the most highly sought after beers on the big beer rating sites. In fact Bryan Roth’s recent analysis of RateBeer’s 2015 list of the most highly rated beers shows that 15 of the top 25 beers are imperial stouts. David meets the Dark Lord. It’s an underappreciated fact that Ohio is making some of the best Imperial Stouts out there. Over the past 10 years Ohio has won four gold medals at the Great American Beer Festival in the Imperial Stout category, more than any other state. So it seemed like the perfect intersection of global and local to pit four of the best Stouts in Ohio against six of the most sought after stouts from the rest of the country. Because they are such big beers we decided to limit the field to 10 beers, which is sure to bring howls of protests from readers for leaving out their favorite. I’m fully aware that many excellent beers were omitted, including but not limited to Speedway Stout (Alesmith), Ten Fidy (Oskar Blues), Siberian Night (Thirsty Dog), Old Rasputin (North Coast), Darkness (Surly), Sohio Stout (Columbus Brewing Company), Plead the 5th (Dark Horse), Blackout Stout (Great Lakes), Parabola (Firestone Walker), and Yeti (Great Divide). What can I say, we couldn’t taste them all in a single night and hope to write anything coherent about the experience. I guess that serves as motivation for future rounds of taste testing to settle the score once and for all. We tried to avoid special release imperial stouts that require advance planning and taking the day off work to score a bottle, like Founder’s KBS or Bell’s Black Note Stout. We also excluded beers that are not sold in Ohio either because of small distribution footprint (sorry Toppling Goliath and Cigar City) or an abv that exceeds the legal limit of 12% (sorry Goose Island and The Bruery). The one exception to both rules is the inclusion of Three Floyd’s Dark Lord, because my friends Hannah and Ian who hosted the event, had a bottle and were willing to share. So while nearly all of the beers are seasonal releases with a little awareness you can readily find 9 of the 10 beers in Central Ohio at the height of stout season. 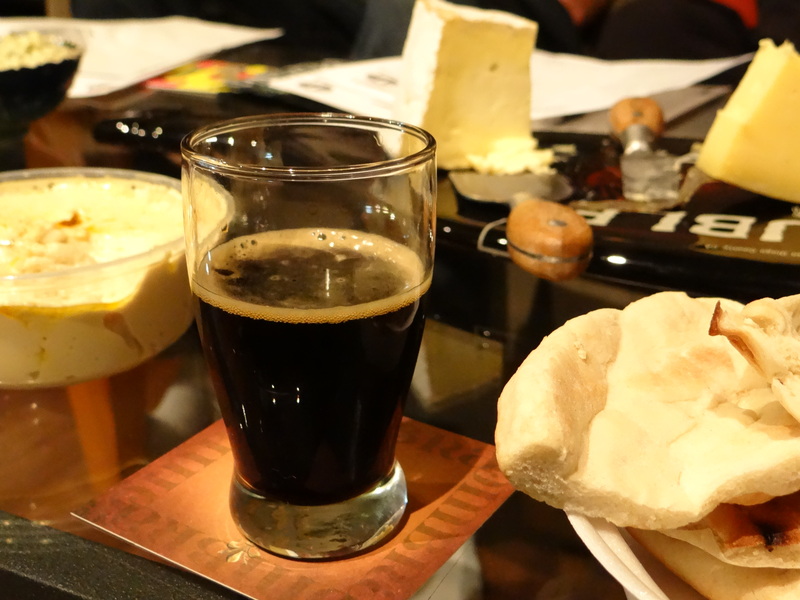 As if there weren’t enough calories in a 12% abv stout, why not throw in some rich buttery cheese. The judging panel consisted of myself and eight friends, including Mark, Josh, Anne and Hannah all of whom are veterans of past Pat’s Pints blind taste tests. We were joined by first timers Ian, Kurt, David and Erandi. It‘s a panel that brings a lot of love and enthusiasm for good beer, but I would be the first to admit that we are not certified judges, so take the results for what they are. Just like previous tastings the judges were blind to the identities of the beers and we used the 50 point BJCP system to score each beer. At the end of the night each judge rank ordered the beers from first to tenth and we tallied up the rankings, which leads to a scale that can hypothetically range from 9 (best) to 90 (worst). Bear in mind that among this elite group of beers even a last place finish is nothing to be ashamed of. After the contest I went back and tasted as many of the beers as possible one at a time to put together the tasting notes given below. It’s hard not to be giddy when you’re drinking beer this good. To avoid being repetitive let me say at the outset that all ten beers were very dark with color/clarity ranging from nearly opaque to Spinal Tap black. Despite abv’s that ranged from 8-15% none of the beers was inappropriately boozy, and while some beers were sweeter than others none were cloyingly sweet. Let’s just say I wouldn’t turn down a blind date with any of these beers. Without further delay let’s get to the results. 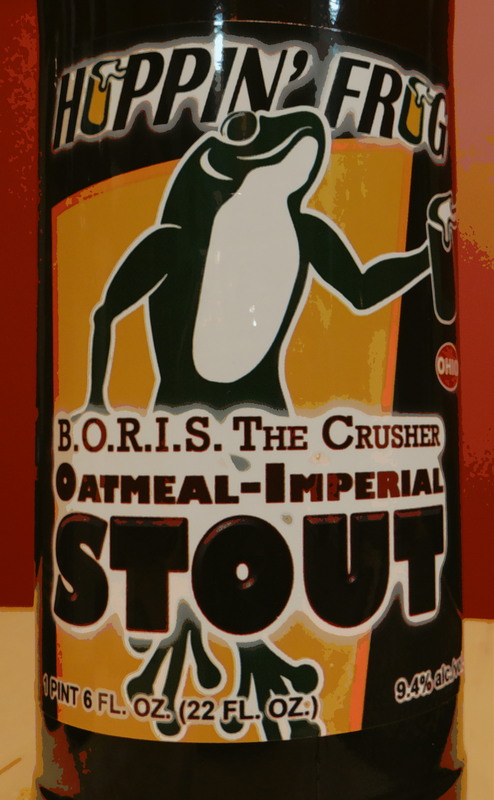 Marketed as an Imperial Oatmeal Stout, Hoppin’ Frog’s Boris the Crusher was deemed the best imperial stout in the land by the judges at the Great American Beer Festival in 2008 and again in 2011. Unfortunately it was not able to repeat that dominating performance with the humble but earnest panel of judges assembled for this event. Dark and utterly opaque, the aroma is an inviting siren call of dark chocolate, but the taste is all about intense roasted malt flavors—dark chocolate and French roast coffee. The combination of charred malts and hops makes for a fairly high level of astringent bitterness. Don’t let the cute frog on the label fool you, Boris is for people who like their coffee strong and black, and think that milk chocolate is for little girls. 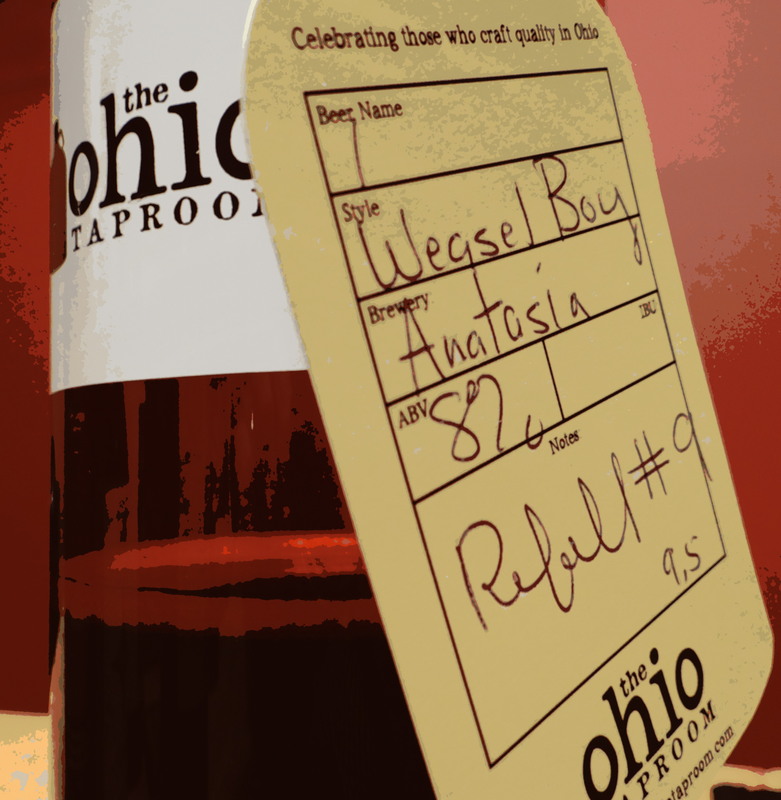 Another Ohio brewed GABF gold medal winning imperial stout (2012) Anastasia is the most celebrated beer to come out of Weasel Boy Brewing in Zanesville, OH. Like Boris the dark chocolate and espresso flavors are prevalent here, but there is also a vanilla note on the nose and the intense roastiness of the malts have been dialed back a notch, all of which makes for a more accessible beer in my opinion. There are enough hops in this beer to add a subtle floral note to the nose and keep the finish dry. Not as complex as some of the beers still to come, but the malt-hop balance is nicely dialed in on this offering from the smallest brewery represented in the contest. 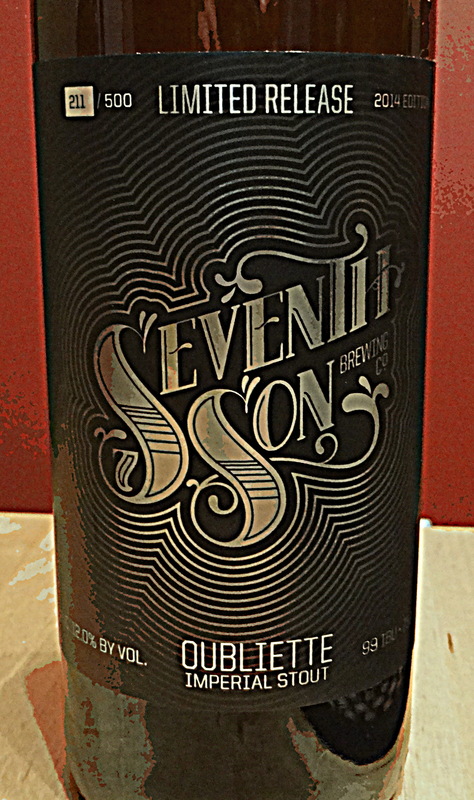 The brewers at Columbus’ Seventh Son are at their best when brewing beers where the hops are prominently featured, so it should come as no surprise to learn that Oubliette was the hoppiest beer of the evening. That’s not to say this beer doesn’t have a lot of roasted malt character, but this is the only stout we tasted where the hops had enough umph to cut through the malts and get your attention. It is after all difficult to use enough malts to completely mask the hops in a beer with 99 IBUs. The fact that it finished above two gold medal winning Ohio brewed stouts is a testament to how well the citrus and floral flavors from the hops work with the chocolate and coffee flavors of the malts. If you like your Imperial Stouts to be IPA-leaning look no further than Oubliette. Released once a year, Dark Lord Day is one of the most celebrated events in the craft beer universe. Fortunately for the rest of us Hannah and Ian attended the 2014 Dark Lord Day in Munster and brought back some booty from the party. So how does this iconic beer stack up against the competition? 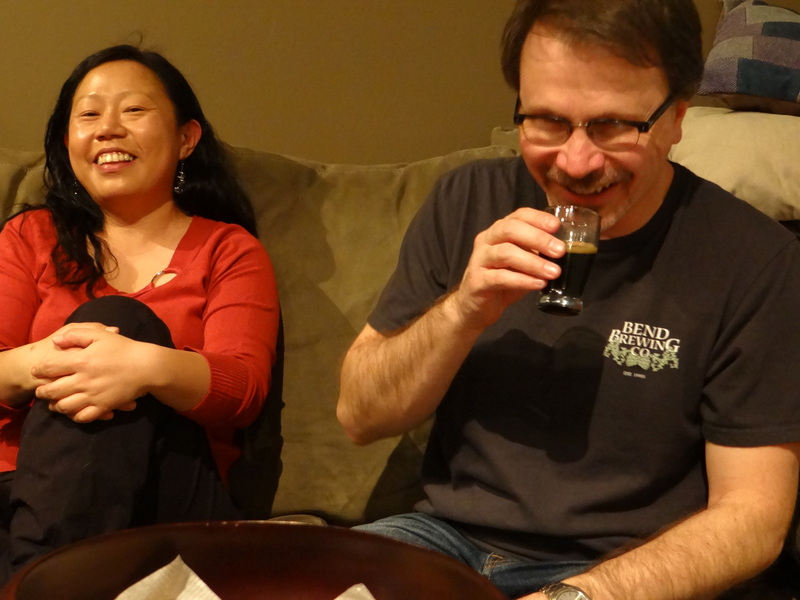 In addition to the chocolate and vanilla flavors that appeared many times over the course of the evening, there was a savory soy sauce like richness that set Dark Lord apart from all of the other beers. Although it was the sweetest beer we tasted, it did not stand out from the crowd for being boozier than its peers, an impressive feat for a beer that tips the scales at 15% abv. The judge’s opinions on this beer were quite divided, ranging from first on Anne’s ballot to last on Kurt’s ballot, but if you are looking for a stout that resides at the corner of sweet and umami streets this is the one. 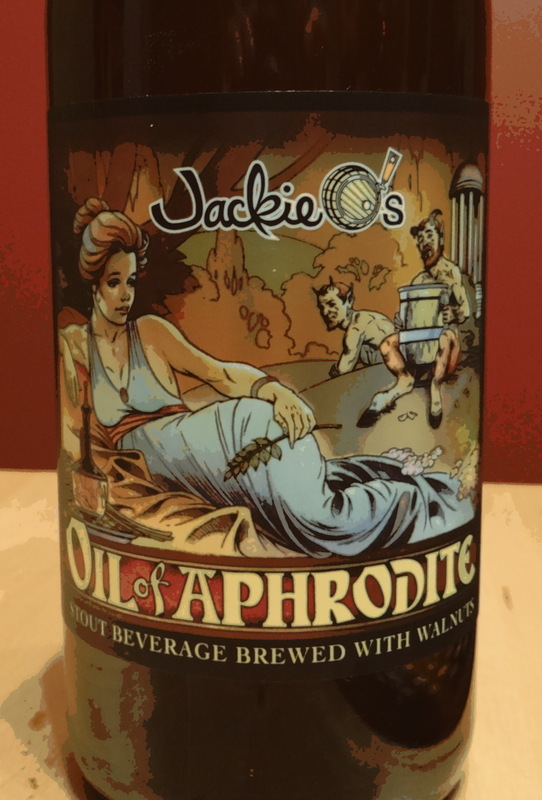 Jackie O’s makes Oil of Aphrodite with black walnuts and Belgian candy syrup, an unusual combination of ingredients not found in the other stouts we tasted. The result of this Athens alchemy is a beer that possesses a nice chocolaty flavor with a touch of vanilla and subtle nutty highlights. It passes the goldilocks test when it comes to the balance between sweet and bitter, and gets further kudos for a thick, silky smooth mouthfeel. While there are more complex imperial stouts among this group there are few that are more drinkable, a potentially dangerous attribute for a beer that is 10% abv. A middle of the pack finish is not too surprising for a beer that delivers the rich flavors you expect from an imperial stout without resorting to an all-out assault on your taste buds. There’s no shame in finishing in the middle of this group of highly acclaimed stouts, and Jackie O’s does earn bragging rights as the top finishing Ohio beer. Yet another GABF gold medal winner (2007), Deschutes gets the prize for the most complex recipe. 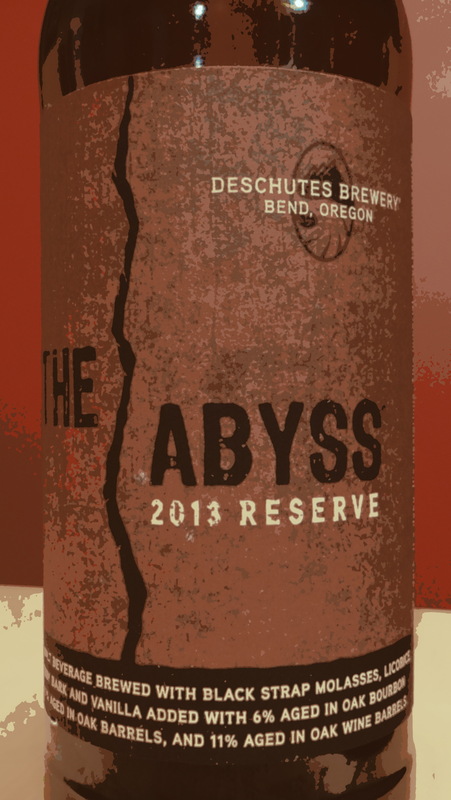 The Abyss is brewed with blackstrap molasses, brewer’s licorice, cherry bark, and vanilla beans. As if that isn’t enough the final product is a blend of beer that was aged in oak bourbon barrels (6%), oak pinot noir barrels (11%), fresh oak barrels (11%), and not aged in barrels of any type (72%). Labeled with a best after date, our bottle was dated best after 8/16/14 which means it was released in the fall of 2013 and was getting close to a year and a half old when we opened it. The cherry bark and brewer’s licorice combine to give an aroma that immediately stands out from the other stouts. Those flavors are also quite prominent in the taste, whereas the vanilla and oak notes are not easy to discern in the wild rumpus of flavors that greet your tongue on every sip. Subtle notes of bourbon can only be perceived at the finish, but the 11.1% abv leaves you with a warming sensation that wells up from somewhere in your abdomen. This was another polarizing beer for the judges. It finished in the top three on four ballots, but those votes were offset by an eight place finish with three panelists. It could be the most distinctive beer of the evening though. 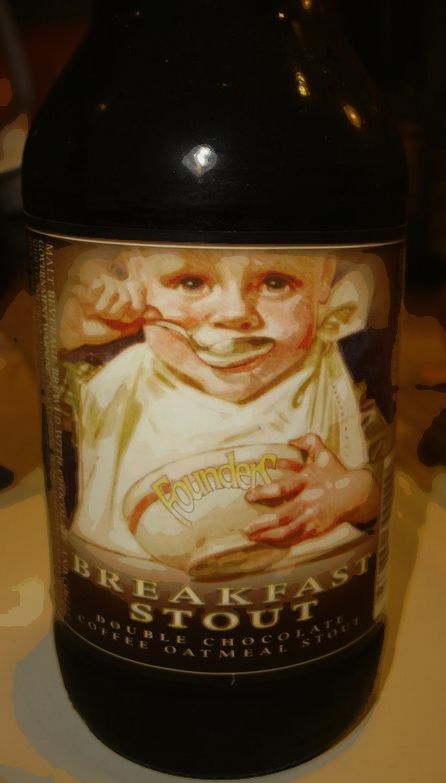 Founder’s uses flaked oats, bitter chocolate, and two types of coffee to brew this readily available but hugely popular winter seasonal. You don’t have to stake out your favorite beer store or make friends with someone in Michigan to get your hands on a bottle of Breakfast Stout. It’s readily available across the Midwest from October into January. Interestingly in the blind format the coffee flavors were not as up front as I would have anticipated. They are present of course but no more pronounced than they were in many of the other imperial stouts we tasted. However, the use of chocolate imparts a chalky, cocoa like flavor in the mid-palate that was not found in most of the beers. There is enough bitterness from the hops to keep the flavor from straying into dessert beer territory, and for such a big, flavorful beer the finish is fairly clean. The alcohol is well hidden in the taste but it does impart a warming sensation on the way down. If you like your imperial stouts chocolaty and eminently drinkable it’s hard to go wrong with Founder’s Breakfast Stout. Bell’s website claims that Expedition Stout is one of the earliest examples of a US brewed Russian Imperial Stout. While I wasn’t able to track down its inception date, I can tell you that it won a silver medal in the 1995 Great American Beer Festival, which means at a minimum it is approaching legal drinking age. This is one of those beers whose color and viscosity are reminiscent of motor oil—thick and dark as night with a minimal brown head. The aroma is an inviting mixture of chocolate, vanilla, and booze, with the slightest hint of dark fruit. If I didn’t know otherwise I would guess this beer spent some time in a bourbon barrel. There is not so much vanilla in the taste, but the dark fruit flavors are more prevalent. The beer finishes with an intense swell of plums, espresso, unsweetened cocoa, and enough alcohol to remind you of its potency. Definitely more bitter than sweet the intense flavors are not for the faint of heart, but if you are looking for the kind of beer that Vladimir Putin guzzles after a day of shirtless horseback riding look no further than Expedition Stout. 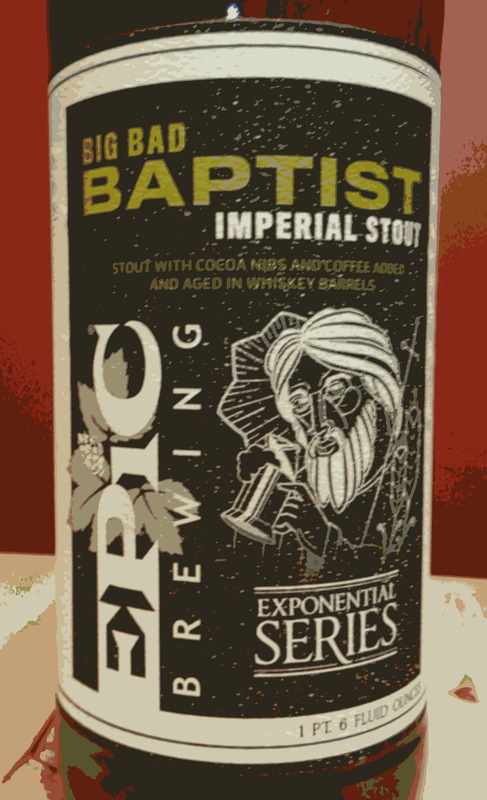 Big Bad Baptist is brewed with cocoa nibs and coffee beans then aged in whisky barrels. Adding to the intrigue Epic uses a different coffee for every release. We were drinking release #13 which was packaged in August of 2013, weighs in at 12.2% abv, and features Ibis coffee. I had tried BBB once before and thought the coffee was a little too overpowering, but in this incarnation everything came together perfectly (possibly a year and a half of aging has something to do with that). 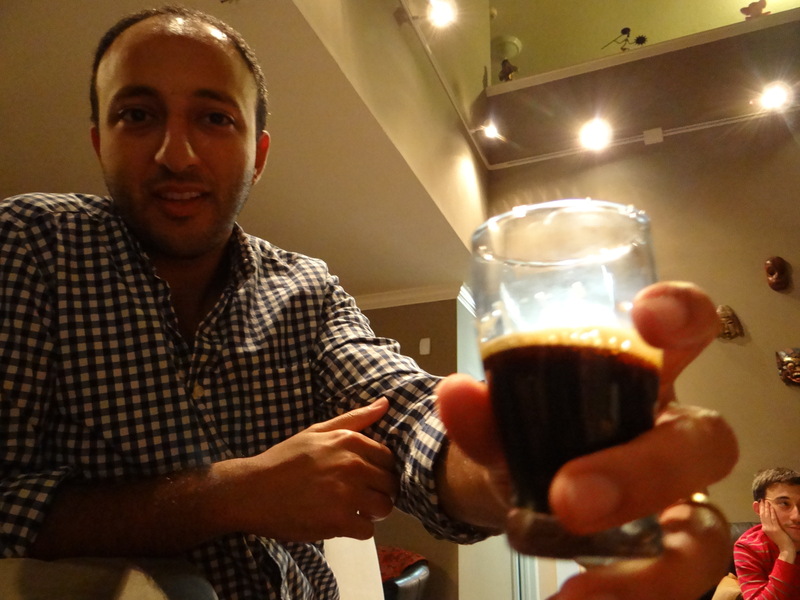 The nose is a big shot of double espresso accented by oaky notes from the barrel. The taste is a complex blend of green coffee beans, chocolate malts, and mild oaky vanilla highlights, all blended in a package that goes down unbelievably smooth for a beer this strong. This big, badass of a beer will leave you wanting more. I can already hear people questioning the credibility of the entire event, because the best imperial stout of the night is marketed by Ballast Point as an imperial porter. 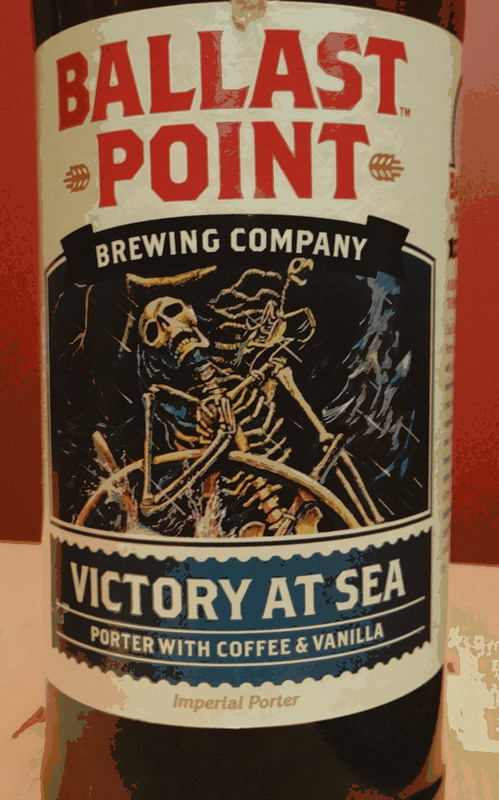 Before you call for the FCC to revoke my beer blogging license let me point out that Victory of Sea (10% abv, 60 IBU) is way outside the BJCP guidelines for a robust porter in terms of both abv (5.0-6.5%) and IBU (25-50). So I’m going to stand by my assertion that this is an imperial stout in all but name. Infused with beans of vanilla and coffee, this beer is a decadent treat for the senses. The taste is a masterful mélange of dark fruits, vanilla, chocolate, caramel, and coffee. The vanilla does not taste the least bit artificial and blends oh so well with the other flavors to give a rounded smoothness that mimics the effect of barrel aging. The bitterness and roast malt astringency are comparatively low, and the alcohol is hard to detect. More Barry White than Metallica, the end result is something that approaches a dessert beer with a deliciousness factor that is off scale. The results speak for themselves, but I can make a few observations. When the field is this strong some things come down to personal taste. As a testament to that 5 different beers (50% of the field) finished with a vote for the best beer of the night from at least one judge. As an advocate for Ohio brewed beer I have to admit that it’s mildly disappointing that all of the Ohio beers finished in the lower half of the standings, but the out state competition was extremely stiff. It’s interesting to note that the top rated beer on RateBeer.com, Dark Lord, could do no better than a tie for seventh. It’s limited availability and massive release party no doubt help boost its score. There was no correlation between abv and order of finish, but the beers that had been aging in one of our cellars for more than a year (The Abyss, Big Bad Baptist, and Victory at Sea) all finished in the top four. It just goes to show that putting a little age on an imperial stout is almost always a good thing. I enjoyed the post and was glad to see a beer from Weasel Boy Brewing make the list. I have family living in Zanesville and the last time I was there it is the only brewery in the city. That is a great list and a few that I haven’t (yet) had. If I were to contribute one not tasted or mentioned, but easy to obtain elsewhere, it would be the Victory Storm King Imperial Stout. I appreciate what is available (e.g. Cigar City and others) at local grocery stores. Good to hear from you Mike. I’m pretty sure that Weasel Boy is still the only brewery in Zanesville. I’ve had limited exposure but what I have tried has been good. I’ve heard good things about Storm King. I’ll have to try that one. What did you think of The Dogfather that you tried a month ago or so? I’m going to try and review one stout a week for the next month or so. Check back if you want more feedback on Stouts. The Laughing Dog Dogfather was full of, or I should say, booming with flavor. It was somewhat overpowering to the palate, and the bourbon notes dominated too much for my preferences, but I should note that bourbon barrel aged beers are not my favorite style. Perhaps I needed a better food or snack pairing. Although I enjoyed splitting a bottle, I think I would have liked it better in smaller volume in a shared tasting, like you did in the blind taste test. I’ll give Laughing Dog another shot, since I can get the Sneaky Pete, AlphaDog, Dogzilla Black, and Rocket Dog Rye IPAs (and the Anubis Coffee Porter). If you have a recommendation among those, I would be thankful for the suggestion. That’s an awesome collection of stouts! I’d love to see a post with comparative tasting notes for all of those. If you want to know the inception date of Expedition, ask Larry Bell himself. I’m sure he’d be delighted to let you know. If I were to hazard a guess, though, he probably created it for the festival in 1995. It’s nice to see two Michigan breweries recognized. Have fun! Good suggestion. I’ll reach out to Larry and update the post if I can get the right info. 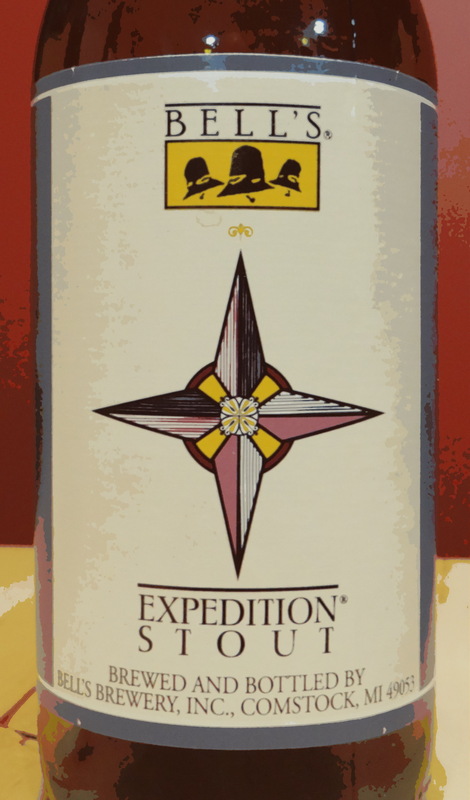 Regardless, expedition stout is a great beer, and under appreciated in my opinion. What I would give for the time, people and resources to do a full-scale blind taste test of beers to show cognitive bias. These tests, however, are a pretty good start. Plus, you know, must be fun, too. It would be extremely interesting to do it in a fully scientific manner. If you had all of the necessary resources what style and group of beers would you start with? Yes these taste tests are a ton of fun. I’m surprised they aren’t more prevalent on beer blogs.